Matthew’s Gospel breaks the long silence which followed the ministry of Malachi, the last of the Old Testament prophets. The silence extended for four hundred years, and during that time God was withdrawn from Israel. Throughout this period there were no angelic manifestations, no prophet spoke for Jehovah, and though the Chosen People were so rely pressed, yet were there no Divine interpositions on their behalf. For four centuries God shut His people up to His written Word. Again and again had He promised to send the Messiah, and from Malachi onwards there was a believing remnant who anxiously awaited the appearing of the predicted One. It is at this point that Matthew picks up the thread dropped by the last of the Old Testament prophets. The first purpose of Matthew’s Gospel is to present Christ as the Fulfiller of the promises made to Israel and the prophecies which related to their Messiah. This is why the word “fulfilled” occurs in Matthew fifteen times, and why there are more quotations from the Old Testament in his Gospel than in the remaining three added together. The position which Matthew’s Gospel occupies in the Sacred Canon indicates its character and scope. Standing immediately after the Old Testament and at the beginning of the New, it is therefore the connecting link between them. Hence it is transitional, and also more Jewish than any other book in the New Testament. Matthew reveals God appealing to and dealing with His Old Testament people. The numerical place of Matthew in the Divine library confirms this, for being the fortieth book it shows us the nation of Israel in the place of probation, being tested by the presence of Jehovah in their midst. Matthew presents the Lord Jesus as Israel’s Messiah and King, as well as the One who shall save His people from their sins. The opening sentence gives the key to its contents: “The book of the generation of Jesus Christ, the Son of David, the Son of Abraham.” Seven times over Christ is addressed as “the Son of David” in this Gospel, and ten times altogether is this title found there. “Son of David” connects Christ with the throne, while “Son of Abraham” associates Him with the altar. This opening Gospel explains how it is that in the later books of the New Testament Israel is viewed as cast off by God, why it is Christendom has superseded the Jewish theocracy—the result of rejecting their Messiah. A striking foreshadowment of this is found in the second chapter, where a significant incident—passed over by the other Evangelists—is recorded, namely the visit of the wise men who came from the East to worship the Christ child. In the attendant circumstances we may perceive a prophetic anticipation of what is recorded throughout this Gospel and the New Testament. First, Christ is seen outside of Jerusalem. Then we have the blindness and indifference of the Jews to the presence of their Messiah: unaware that He was now among them, undesirous of accompanying the Magi. Next there are the strangers from a far country with a heart for the Saviour, seeking Him out and worshipping Him. Finally, we behold the civil head, so filled with hatred, determined to put Him to death—presaging His crucifixion by the Jews. Not until the middle of his fourth chapter does Matthew tell us, “From that time Jesus began to preach, and to say, Repent: for the kingdom of heaven is at hand” (v. 17). The time-mark here is, in the light of its context, most significant, emphasizing the same solemn aspect of truth as was adumbrated in chapter ii. First, we are told that our Lord’s forerunner had been “cast into prison” (v. 12). Second, we are informed that Christ “leaving Nazareth” came “and dwelt in Capernaum” (v. 13), for Nazareth (where He had dwelt so long: 2:23) had openly rejected Him (see Luke 4:28-30). Third, it is here emphasized that the Saviour had gone “beyond Jordan” into “Galilee of the Gentiles,” where “the people which sat in darkness saw great light” (v. 16)—another illustrative anticipation of His rejection by the Jews and His turning to the Gentiles. The fourth chapter closes by telling us, “And His fame went throughout all Syria: and they brought unto Him all sick people that were taken with divers diseases and torments, and those which were possessed with devils, and those which were lunatic, and those that had the palsy: and there followed Him great multitudes of people from Galilee, and from Decapolis,” etc. (vv. 24, 25). Some have wondered why our Lord performed these miracles of healing upon the bodies of the people before He delivered His great Sermon on the Mount for the nourishing of their souls. First, it should be noted that these miracles of healing followed His “teaching in their synagogues and preaching the gospel of the kingdom” (4:23). Second, these miracles of healing were an essential part of His Messianic credentials (Isa. 35:4-6). Third, these miracles of healing made way for His fuller preaching, by disposing the people to listen unto One who manifested such Divine power and mercy. The preface to the Sermon is a very short one: “And seeing the multitudes, He went up into a mountain, and when He was set, His disciples came unto Him; and He opened His mouth, and taught them” (5:1, 2). Yet brief as these verses be, there are several things in them which call for careful consideration. First, we must notice the place from which this Sermon was preached. “As in other things, so in this, our Lord Jesus was but ill-accommodated: He had no convenient place to preach in, any more than to lay His head on. While the scribes and Pharisees had Moses’ chair to sit in, with all possible ease, honour, and state, and there corrupted the Law; our Lord Jesus, the great Teacher of truth, is driven out to the desert, and finds no better place than a ‘mountain’ can afford. “Nor was it one of the holy mountains, nor one of the mountains of Zion, but a common mountain; by which Christ would intimate that there is no distinguishing holiness of place now, under the Gospel, as there was under the Law; but that it is the will of God that men should pray and praise everywhere, anywhere. provided it be decent and convenient. Christ preached this Sermon, which was an exposition of the Law, upon a mountain, because upon a mountain the Law was given: and this was also a solemn promulgation of the Christian Law. But observe the difference: when the Law was given the Lord came down upon the mountain, now the Lord ‘went up’ into one; then He spoke in thunder and lightning, now in a still small voice; then the people were ordered to keep their distance, now they are invited to draw near—a blessed change!” (Matthew Henry). We believe there is yet a deeper significance in the fact that Christ delivered this Sermon from a mountain. Very often the noting of the place where a particular utterance was made supplies a key to its interpretation. For example, in Matthew 13:36, Christ is seen entering “into the house,” where He made known unto His own the inner secrets of His kingdom. In Luke’s Gospel Christ is seen as man (the perfect Man) among men, and there He delivers a sermon “in the plain” (6:17)—descending as it were to a common level. But in Matthew His royal authority is in view, and consequently He is seen again in an elevated place. In the seventeenth chapter we behold Him transfigured on the mount. In 24:3, He delivers His great prophetic discourse from a mount. Then in 28:6, we see the Conqueror of death commissioning His disciples from the mount. So here in verse 1, He ascends the mount when about to give forth the manifesto of His kingdom. Next we would notice that our Lord was seated when He preached this Sermon. It seems to have been His usual manner to preach sitting: “I sat daily with you teaching in the temple” (Matthew 26:55). This was the custom of the Jewish teachers: “The scribes and the Pharisees sit in Moses’ seat” (Matthew 23:2). Nevertheless, we are persuaded that the Spirit’s notice of our Lord’s posture on this occasion intimates something more important and significant than that He accommodated Himself to the prevailing mode of the day. In this Sermon Christ enunciated the laws of His kingdom and spoke with an authority infinitely transcending that of the Jewish leaders; and therefore His posture here is to be regarded as emblematic of the King sitting upon His throne, or the Judge upon the bench. “And he opened His mouth and taught them.” Here the Spirit of God has noted the great Prophet’s manner of speaking. First, it is to be understood naturally, and carefully emulated by all His servants. The first essential of any public speaker is that he open his mouth and articulate clearly, otherwise, no matter how good may be his matter, much will be lost on his hearers. Alas, how many preachers mutter and mouth their words, or employ a pious whine which elderly people cannot catch. It is most desirable that the young preacher should spare no pains to acquire a free and clear delivery: avoiding shouting and yelling on the one hand, and sinking his voice too much on the other. Third, as Scripture is compared with Scripture, this expression will be found to bear yet another meaning. “Supplication for all saints; and for me, that utterance may be give unto me, that I may open my mouth boldly, to make known the mystery of the Gospel” (Eph. 6:18, 19). The apostle was referring to a special kind of speech, upon far more weighty matters than his ordinary conversation. So when we are here told that Christ “opened His mouth and taught them” we are to understand that He spoke with liberty and authority, with faithfulness and boldness, delivering Himself upon matters of the deepest weight and greatest importance. It means that, without fear or favour, Christ openly set forth the truth, regardless of consequences. That this is the meaning appears from what we read of at the finish of the Sermon: “The people were astonished at His doctrine: for He taught them as one having authority, and not as the scribes” (7:28, 29). Let us now observe the persons to whom our Lord here addressed Himself. There has been considerable difference of opinion concerning the ones to whom this Sermon really applies: the saved or the unsaved. Extreme positions have been taken on both sides, with a good deal of unnecessary dogmatism. Personally, we regard this Sermon as a forecast and an epitome of the entire oral ministry of Christ, that it summarizes the general tenor of His whole teaching. The older we grow, the less do we approve the drawing hard and fast lines through the Scriptures, limiting their application by insisting that certain parts belong only to such and such a class, and under the guise of “rightly dividing” the Word, apportioning segments of it to the Jews only, the Gentiles only, or the Church of God only. Man makes his canals rigidly straight, but God’s rivers wind in and out. God’s commandment is “exceeding broad” (Ps. 119:96), and we must be on our guard against placing restrictions thereon. A careful study of the four Gospels reveals that Christ’s ministry had, first, a special application to the afflicted people of God; second, it evidently had a peculiar reference to His own immediate disciples; and third, it had a general bearing upon the people at large. 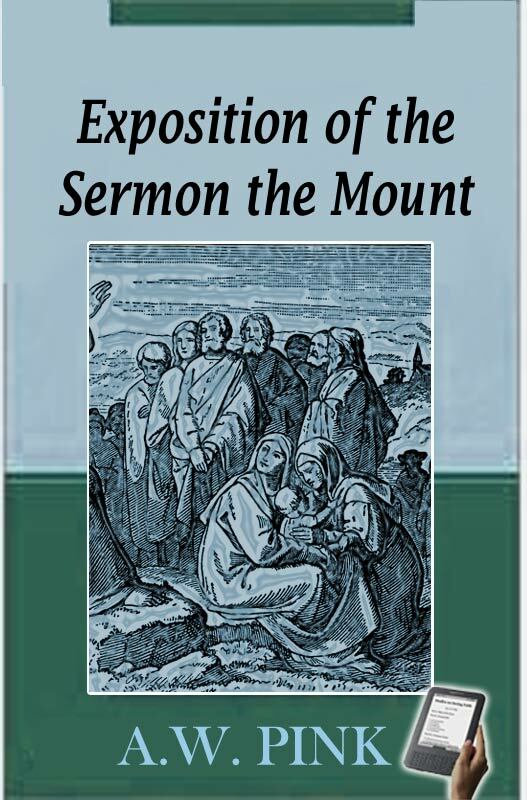 Such we take it was also the case with the Sermon on the Mount, embodying and illustrating these three distinctive features of Christ’s public ministry. First, its opening section (the “Beatitudes”) is most evidently addressed to those who were afflicted in their souls—those deeply exercised before God. Second, its next division referred to His public servants, as will be shown (D. V.) when we take it up in detail. Third, its larger part was a most searching exposition of the spirituality of the Law and the refutation of the false teachings of the elders, and was meant mainly for the people at large. Though we are told at the beginning of chapter v that it was His “disciples” whom Christ here taught, yet it is equally clear from the closing verses of chapter vii that this Sermon was spoken in the hearing of the multitudes. This must be steadily borne in mind throughout, for while it contains much instruction for believers in connection with their living a good, honest, and blessed life, yet not a little in it is evidently designed for unbelievers, particularly those sections which contain a most searching setting forth of the spiritual nature of His kingdom and the character of those who enter and enjoy its privileges. Romish teachers have greatly erred, for they insist that Christ here propounded a new Law—far more perfect than the Law of Moses—and that He delivered now entirely new counsel to His disciples, which was never given in the Law or the Prophets; whereas His intention was to clear the true meaning of the Law and the Prophets, which had been greatly corrupted by the Jewish doctors. But we will not further anticipate what we shall (D. V.) contemplate more fully in the studies to follow. Chapter 02 – The Beatitudes, Cont’d. Chapter 03 – The Beatitudes, Cont’d. Chapter 07 – Christ and the Law, Cont’d. Chapter 12 – The Law and Adultery, Cont’d. Chapter 17 – The Law and Retaliation, Cont’d. Chapter 20 – The Law and Love, Cont’d. Chapter 24 – Prayer, Cont’d. Chapter 34 – Anxiety Forbidden, Cont’d. Chapter 35 – Anxiety Forbidden, Cont’d. Chapter 36 – Anxiety Forbidden, Cont’d. Chapter 37 – Anxiety Forbidden, Cont’d. Chapter 45 – Seeking Grace, Cont’d. Chapter 51 – False Prophets, Cont’d. Chapter 52 – False Prophets, Cont’d. Chapter 53 – False Prophets, Cont’d. Chapter 54 – False Prophets, Cont’d. Chapter 57 – Profession Tested, Cont’d. Chapter 58 – Profession Tested, Cont’d. Chapter 59 – Profession Tested, Cont’d. Chapter 60 – Profession Tested, Cont’d. Chapter 61 – Profession Tested, Cont’d. Chapter 62 – Profession Tested, Cont’d.